The world’s second largest building after the Pentagon needs rehabilitation, although the construction process over-passed two Communist and democratic decades. Celebrated and booed in equal measure, the House of the People or House of the Republic, today’s Romanian Parliament in Bucharest, started to degrade before being finalized and officially inaugurated. Piping has high water losses and vents are not feeling well. In winter, snow enters the offices through the carpentry, water seeps from the terraces, and heat gets lost due to poor insulation. 31 elevators go up and down in the building, each recording the electricity consumption of a tram, while electricity transformers are like time bombs. The structure’s consumption equals that of a town of 25,000 inhabitants, which led the charge to find solutions for energy efficiency. Sulfina Barbu, MP, former minister of environment, initiated in 2009 the “Green Parliament”, in partnership with local NGOs, and established a program of selective waste management. Technical Director of Building, Alexandru Tanase, has replaced one third of the over 100,000 light bulbs with some economic ones and rehabilitated the heating system. Architect Anca Petrescu, author of the “House of the Republic” project, said the building has as many sins as people can pronounce, and the palace looks today as any disregarded house, inhabited by some ignorant householder. In the absence of an energy audit, which no company has dared to carry out in such a huge building, no one knows exactly what would be the way forward and what sort of investment is needed for energy efficiency in the House of the People. Today switching lights on and off is a computerized process running on scenarios, in regard to needs. Some energy gets saved, but not enough. Mr. Constantin on the other hand has been left frozen in time for the past fifteen years. Each day he diligently walks some four kilometers throughout the People’s House measuring the room temperatures between 6.30 and 7.45, as a nurse would be monitoring new born babies. Prior to the emergence of mobile phones, Mr. Constantin’s certainty of not getting lost in the huge building was done through a series of landline phones placed on his route. Temperature is important for some conference rooms that are plated with expensive materials. According to the results given by the thermometer, Mr. Constantine knows how to adjust the ventilation or heat from the underground ventilation facility. Usually, the lighting scenario is the “economic” one – only the side lamps are lit. A step above that is the “normal” scenario – the chandeliers are half-lit. Finally, there is the “VIP” scenario – a type of Las Vegas. Tanase says that it’s rare that all the lights are turned off. This is because the surveillance cameras of the Guard and Protection Service need a certain level of visibility. Tanase states that at the pace it had the House of the People reached its consumption peak in 1997, when it registered the greatest expenditure costs in its recent history. “We first started using energy efficient light bulbs in 1998. It was a shift to apparently fantastic costs – an incandescent bulb costs 5,000 lei and an energy efficient one costs -300,000 lei. In changing the light bulbs to a hall you have to wait half a year anyway. At this point we have exchanged about 30% of bulbs in the house with economic ones, “Tanase explains. Petrescu also said that, in a building as the House of People, large consumption costs are normal and necessary. “Why are people so surprised? Many kilowatts get consumed during periods in which the conference center is being used. When you light a large area, you also get an income from renting the space. You eventually break even. These are public institutions, you can’t do anything about it,” she concludes. “It beats” the European Parliament on waste and water costs. Nobody expects a building that surpasses Cheops’ pyramid in volume to consume as much as a refurbished villa. However, in a time when the world is turning to renewable energy, and reducing its carbon footprint and consumption, the huge House of the People is the epitome of energy waste. In absolute numbers, the Palace of Parliament in Romania annually consumes double the quantity of drinking water – 575.000 cubic meters – compared to the three buildings of the European Parliament (EP) put together – in Brussels, Luxemburg, and Strasburg. Continuing the comparison, the People’s House produces annually an equal amount of waste – aprox. 2,700 tons. The same as the three buildings of the EP put together. The difference is that in the EP 50% of all waste is recycled. In the People’s House that process is just timidly starting. In regards to electricity, despite the pretentious chandeliers, the lifts, and other energetically unfriendly machines, the House of the People is still in the minor league compared to the EP. In Romania, the consumption reaches “only” 15.6 kWh, about the same as the EP building in Luxemburg. The building in Strasburg consumes twice as much, while the one in Brussels consumes four times that value. On the other hand, the energy consumed at the EP buildings is one hundred percent green. That means the energy comes from solar panels, wind turbines, hydroelectric sources, etc. In terms of surface, the three buildings of the EP and their annexes sum up to one million square meters, while the Parliament Palace occupies only 330,000 square meters. The high water consumption is caused by an outdated infrastructure of pipes in the building. The Palace of Parliament has 150 kilometers of pipes, while their actual refurbishment is currently only around 10.5 kilometers. A situation which is somewhat similar to that of any town in Romania. “The water consumption has quadrupled since 2004,” Tanase states. ”575.000 cubic meters of water were consumed in 2008. These increases are also due to the greater degree of occupation of the Palace of Parliament,” he explains. Regardless, the expenses also have increased. They occur without anyone even considering the possibility and are commonly noticed much later. “In a normal house it’s quite usual that a pipe might crack, not to mention in a building the size of a small town. Today for instance a pipe cracked. If under it there were a hall with decorations of four karat gold or fine wood it would be quite tragic. A while ago a heater broke down and it wasn’t noticed for some time. The water drained, but wasn’t noticed by the technicians because it was a small detail. Until the water started flowing into the hall ways, considering the immensity of the structure, the problem wasn’t even found out. Finally the reparation costs was 70.000 Euros,” Tanase states exemplifying the risks of a trivial heater break down. As administrator of the People’s House, Alex Tanase says he has a great achievement, but an equal frustration. He overhauled the main heating unit of the building increasing its efficiency by 25%. However, the same success didn’t apply to the house’s “chill factory”. After the auction held for its overhaul a firm that didn’t even take place in the bid contested the results. Within the foundation of the People’s House a great chamber houses multiple containers holding venting and cooling machines. Two such containers work non-stop for the main hall alone. Further back, there are five inoperative “steam engines” constituting the main cooling unit that was shut down in 2008. “They would roar like airplanes when turned on and consume 470 kilos of Freon annually,” Tanase explains. The “chill factory” used to consume 3.250 kWh and was manufactured by a now bankrupt company from the former German Democratic Republic. “The operating costs were great even at 5-7% capacity. It was badly designed from the start. It was running on R22 Freon which was subsequently banned, so we shut it down. It did work until 2008 and it provided air conditioning for the ground and first floor,” Tanase describes. “Some complain that the building doesn’t have air conditioning. Why, because all the halls have it, and the installations are designed for it? Everything is done by ear here. A more thorough study had to be conducted for the cooling unit along with the engineer who would provide working parameters. I don’t even know if the unit eats up energy because I have no idea of its parameters,” Petrescu complains. All in all, the architect admits she is a little out of touch with the global concern for energy efficiency. But she does remember that at the time of the People’s House’s design, Ceausescu solicited a few modifications for energy saving. “Carbon footprint? What the hell is that? I’ll look it up. Anyhow, even before 1989 there was a preoccupation with energy saving. My project entailed a glass wall in front with distanced columns. They asked me to reduce the size of the glass surface to save energy. With walls. I’ve also heard about the thermal rehabilitation of the building. They wanted to attach sheets of polystyrene over stone and marble. The biggest idiocy! The walls were very thick. For six months The National Institute for Research and Development in Construction (NIRDC) studied wall thickness so that thermal exchange to be minimum”, the building’s author explains. Outside the temperatures were below zero and there was a thick sheet of snow over Bucharest when we visited Anca Petrescu in her office at the ground floor of the People’s House. The layer of snow blowing through the office’s windows was as thick as the one outside. Despite the few radiators that were struggling to substitute the lack of proper heaters the office was quite cool. In this context, Anca Petrescu told us about the “more than thermopane windows” of the People’s House: “These windows are more than thermopane. There are three lairs of glass, thermopane one the outside with an aluminum frame: the best insulation. We had to do this everywhere, but the windows won’t lock shut. Is it normal to not repair the windows for twenty years? The windows were not of my design, they were made according to the data from NIRCD,” Petrescu points out. Not even the administrator’s office is snow free. Tanase says that this is not due to improper care, but bad design and irreparable old age. He admits that changing the windows of the People’s House would be the deal of the century in Romania. However, he doesn’t believe anyone would approve such a thing when any expense for the maintenance of the “pyramid” – as Tanase pampers his work place – is bureaucratically founded. Also, the fear of tabloids printing “The congressmen have bought another trinket for their comfort” is another deterrent. Finally, around the fall of 2009, the Chamber of Deputies rallied up a committee of professionals in the field to do the audit. The committee didn’t have any result, Tanase says. Now he has some promises from a Dutch company who have offered their services for free for the sake of the legendary building. The house will last 500. What about the rest? Until the energetic audit however, the People’s House wastes a lot of energy inefficiently. Even though refurbished, the heating unit can’t handle the entire structure. The ventilations system is equally inefficient so all the offices have been equipped with AC units which in turn encumber the structure’s electrical grid. Alex Tanase says that he treads lightly so that the system doesn’t cave in because of strain: “I don’t think the electrical grid was designed to withstand all the appliances currently in the building. For example, I have three computers on my desk. The electrical panels and fuses that burn and pop like nuts date back to Ceausescu. The building also has sixteen electrical converters. One of them is up to date because of the improvements for the Museum of contemporary art. They needed the works on display to be kept in a proper environment. A new converter costs thirty billion lei plus ten percent for set up. We still have converters that run on oil. If one of them blows up people die. All of them were already outdated when they were brought in. The civil protection also had converters like this in bomb shelters, but even those guys switched them. We’re the only ones left to have them.” Tanase describes the building’s “electrical grid”. The unanimous decision is that the building that houses almost twenty institutions beside the Romanian Parliament needs an overhaul for an efficient level of energy consumption. On this matter, Sulfina Barbu, a member of the Chamber of Deputies, initiated in the summer of 2009 the “Green Parliament” Project, in collaboration with Green Revolution Association. The project entails the selective collection of waste, paper recycling, replacement of lighting materials and electrical appliances with more economical units. “The Palace of Parliament consumes as much as town with a population of 25.000 people. And it is necessary to rationalize our consumption to reduce the huge bills pay out of the public’s pocket. <<Green Parliament>> means a building friendly both to the environment and the public budget,” Sulfina Barbu considers. The deputy states that in no less than six months the project has shown promising results: “ Form June to October, 11.5 tons of paper, 3.5 tons of plastic, and 0.5 tons of glass have been collected from the Chamber of Deputies. The results were promising. Consequently starting with this experience we’ve placed a legal initiative that all public institutions practice selective collection of waste starting 2010. Regarding this initiative I’ve received the support of the nongovernmental organization Green Revolution.” Last fall the NGO organized three major conferences on “The Palace of Parliament reduces its carbon footprint”. Specialists from a series of fields discussed the opportunities for reducing consumption of water and energy, and also the creation of a system for selective collection of waste and recycling. “I don’t believe they didn’t find a company to perform the audit. Rather they never had the money to pay for it,” said the president of the Energetic Auditors Association, Emilia Cerna Mladin. Mladin considers that such an operation for the People’s House – which is “a little energetic disaster” – is both difficult and risky due to its unprecedented complexity. “We’ve proposed Tanase the audit two years ago. But it is indeed a very challenging operation. Its complexity stems from the many elements that are linked to security and control. Moreover, at the time, the building didn’t have any plans of architectural or technical nature at all. Those items alone are very expensive, maybe more expensive than the audit. It can take a long time and money,” Mladin added. The standard audit price for normal buildings ranges between 1 and 3 euro/sqm. However, Mladin believes that when it comes to a building the size of the Palace of Parliament the price might drop below 1 euro/sqm. Without an audit Mladin believes that all expenses for the building’s rehabilitation are senseless. 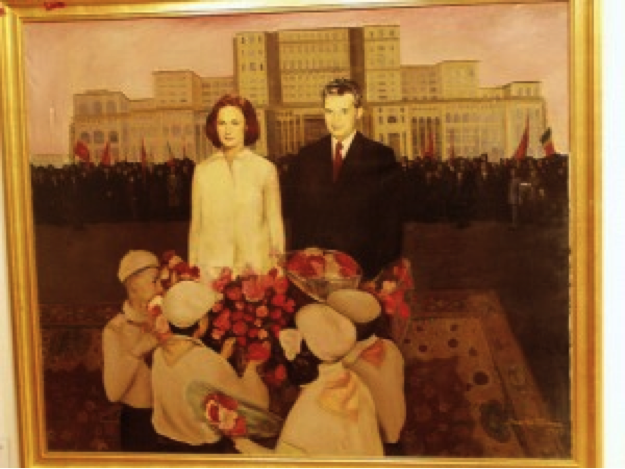 “Today, 25th June 1984, in our fortieth year of anniversary of the revolution of freedom and national upholding, of unbound development and independence of Romania, we have commenced the erection of the House of the Republic and the boulevard Socialism’s Victory; proud and glistening progenies of this era of great revolutionary transformations, monumental structures that will remain here over the ages as an impressive reminder of the strong will of the citizens of Bucharest, of the entire Romanian people; granting dignity and greatness to our countries capital, our socialist homeland, Romania.” Thus reads an old manuscript buried in the innards of the People’s House; the author, Ceausescu. In truth, actual building was started one year earlier than stated. On the 25th of June 1984 the structure was still a level surface. To prepare the site, the neighborhood Dealul Arsenalului was demolished – over seven square kilometers of the capital’s former center. And over 40.000 people were relocated. Among the disappeared structures are the Vacaresti Monastery, the Brancovenesc Hospital, the National Archives, and the stadium Republica. The building has a spread surface of 330.000 sqm and is listed in the Book of World Records as the second largest administrative building in the world after the Pentagon. Its 2.550.000 cubic meter volume place the structure on the third place in the world, succeeded by the space shuttle assembly plant at Cape Canaveral, Florida, and Quetzalcoatl’s pyramid in Mexico. The People’s House is 2% larger in volume than Cheops’ pyramid in Egypt. The Palace of Parliament’s construction, at that time, was part of an ensemble named “The country’s new political center”. An urbanism contest was organized for the ensemble. The contest emphasized nationally representative buildings: The National Museum of History (so called, the Radio-House), the National Library, the Opera, the Ministry of Defense, the Guest House (today, the Marriott Hotel), and the Romanian Academy Building. “This center had to align itself to a new axis that was about to be built in Bucharest. The idea wasn’t an original idea of Ceausescu’s. It was in fact inspired by Carol the II’s program of 1934. The press of ’38 announced the commencement of demolitions for the opening of the new east-west axis –today’s Unirii Boulevard. And the Chamber of Deputies was to be placed on Dealul Arsenalului,” Anca Petrescu explains the idea’s origin. In December 1989 the People’s House was 80% finished. However, the work was halted due to a revolt of the population and the numerous voices crying for a national debate concerning the building’s future. At that time, estimated construction costs were at $1.75 billion. In 2006 to costs estimations were at 3 billion Euros. Work on the site recommenced in 1993, when the decision was made that the Chamber of Deputies would move in the People’s House from Dealul Patriarhiei. Along the years 200 architects and over 20,000 laborers constructed the building, working in three shifts to ensure streamline continuity. Today the building has approximately 1,000 rooms, 440 of which are offices. Also there are over 30 halls, 4 restaurants, 3 libraries, 2 underground parking lots, a concert hall, the remaining rooms are left unused. The Romanian Senate also moved in the building in 2004. According to Alex Tanase, the building has about 11% unfinished surfaces. While the architect Anca Petrescu states that, at the moment, the structure is entirely occupied, unfinished parts being left only in the lower levels. In December 2009, after twenty years, the building’s designer managed to put together and deliver the structure’s technical plans. The People’s House is yet to be officially inaugurated. The People’s House is a gigantic entanglement of monumental sculptures, carvings, decorative floors plates, elegant ceilings, fine silk drapes, and rugs. All of these are stretched on a line of halls, galleries, ball rooms, and other chambers of great proportions. Expensive marble alternates with fine wood and crystals from the chandeliers. 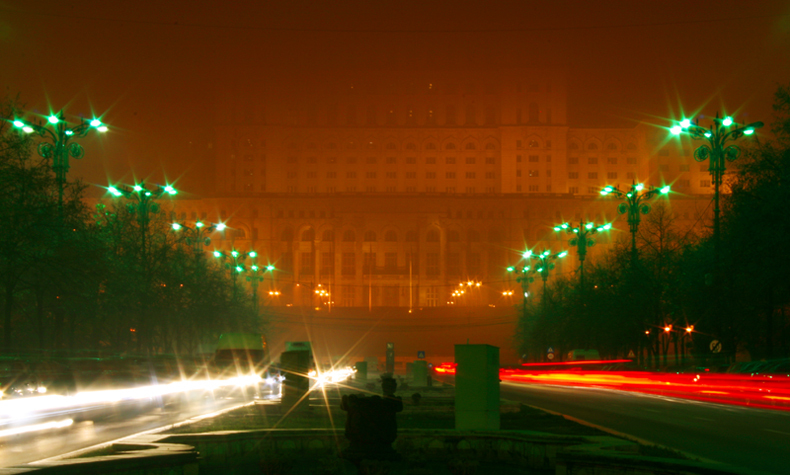 The building has been hated by Romanians because of its ominous association with the megalomania and lust for power of the dictator Ceausescu. The People’s House was erected by ruining the former heart of the capital and the starvation of its People. Foreign appreciation of the building has lessened the formerly strong feelings of dislike. House of the People – 24 million lei (5.732.953 euro), approximately 12% of the Chamber of Deputies’ entire budget. The budget was above 71 million Euro. 314,000 lei – cleaning appliances; 8,113,000 lei heating and lighting; 1,286,000 lei – water, sewage, cleansing; 11,155,000 lei new constructions; 3,660,000 lei maintenance of parking lot; 10,933,000 lei capital repairs. Total – 33 million lei.